Until recently, the low-income housing community has been a tough nut for the solar industry to crack. Low-income housing developments have historically avoided going solar due to the obvious difficulties of incorporating high-cost, discretionary photovoltaic (PV) systems into affordable housing. 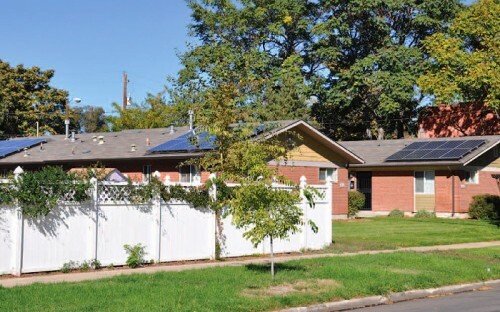 However, a unique mix of local, utility, and federal support combined with a little financial creativity allowed a community in Colorado to demonstrate the application of PV into a low-income housing program. Governor’s Energy Office of Colorado. Collectively, these organizations put the pieces together to develop the Whittier Affordable Housing Project (WAHP). Within WAHP, 30 affordable housing rentals across 12 buildings received residential-scale solar PV systems . Figure 1 shows three of these systems. One of the key enabling factors of the low-income solar housing is also evident in Figure 1; each of the housing units selected in the program is smaller than the average American home and has undergone recent energy efficiency retrofits (e.g., insulation, lighting, and building envelope improvements). Because of these small and energy efficient housing characteristics, the WAHP program was able to utilize relatively small 1.88-kW systems to offset approximately 85% of the occupant’s energy usage. The small size of the individual systems allowed for a greater number of system installations across WAHP . Like most renewable energy financing arrangements, the partnership utilized any and all available revenue streams to have the PV system’s economics pencil out. First, the project was set up for the first six years as a third-party financing mechanism, where a private tax-paying investor owns the PV system to take advantage of the federal 30% investment tax credit and accelerated depreciation benefits. Second, WAHP received a $2/Watt upfront cash incentive from the local utility Xcel Energy that significantly bought down the cost of the PV systems. Xcel also agreed to purchase the renewable energy certificates (RECs) at a healthy $0.11/kWh for the first 20 years of the project’s operation. Additionally, the low-income housing residents paid $0.08/kWh for the energy produced by the PV systems. By comparison, the average electric rate for NDHC residents was $0.95/kWh, thus the PV is projected to save NDHC money over the course of the 20-year contract period. Even with these large revenue streams, there was one more puzzle piece required to complete the financing . NDHC was successful in applying for a $107,500 grant from the Governor’s Energy Office of Colorado to finance the project. The NDHC award was immediately loaned to the investor to provide the final revenue piece to make the project viable. The investor, in turn, repays the loan with interest to NDHC over six years. At year seven of the project, NDHC will buy out the investor using the loan and interest repayments and will own the low-income solar project . Figure 2 illustrates the lifetime cash flows between the investor and NDHC. Although not all tenants in NDHC received PV systems on their rooftops, WAHP program designers also implemented several community-wide programs to broaden the overall appeal. First, a PV installation training and education program was created for low-income residents. From this training program, several community residents were hired by a local PV installer. Second, a neighborhood-wide energy conservation incentive program was established and funded through savings from the PV installation . Lastly, the community was able to showcase its program as a first-of-a-kind in the nation with successful implementation. Despite WAHP’s use of the one-time grant to fully fund the program, it was intended for the model to be a roadmap for other communities to follow. Since the development of WAHP, there have been sizable reductions in both renewable energy subsidies as well as PV system prices. Therefore, other communities will need to customize their program to take advantage of local financial strengths and resources, but WAHP demonstrates the successful application of PV to all income classes. Dean, J.; Smith-Drier, C.; Mekonnen, G.; Hawthorne, W. “Integrating Photovoltaic Systems into Low-Income Housing Developments: A Case Study on the Creation of a New Residential Financing Model and Low-Income Resident Job Training Program,” September 2011. Accessed April 23, 2012.